Within the Company Configuration area of Sentle you will find the ‘Manage Users’ tab. When selecting this tab you will be presented with the current list of Sentle users as below. 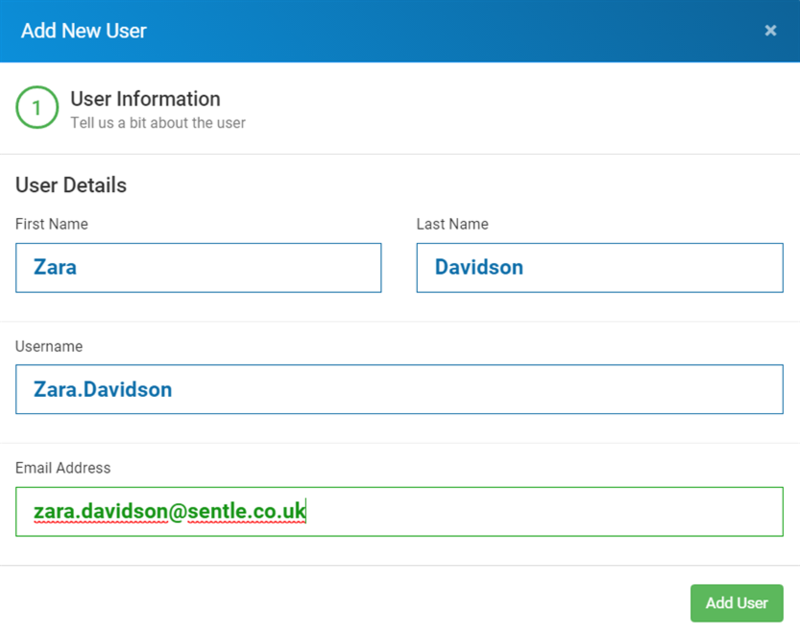 As a Sentle Administrator, you are able to add new users and edit their settings within this area. Other users can be given Administrator rights so that they are able to add and edit users also. Select ‘Add New User’ to create a new Sentle user. When selecting ‘add new user’ you will be presented with the screen shown below. Add the users First and Last name and give them a user name that they will use to log into your Sentle system. New users will receive an email with the following welcome message. The email will provide them with the web address of their Sentle system and a button via they can continue and set up their password to be used in their Sentle login. New users will be asked to create a password as follows. 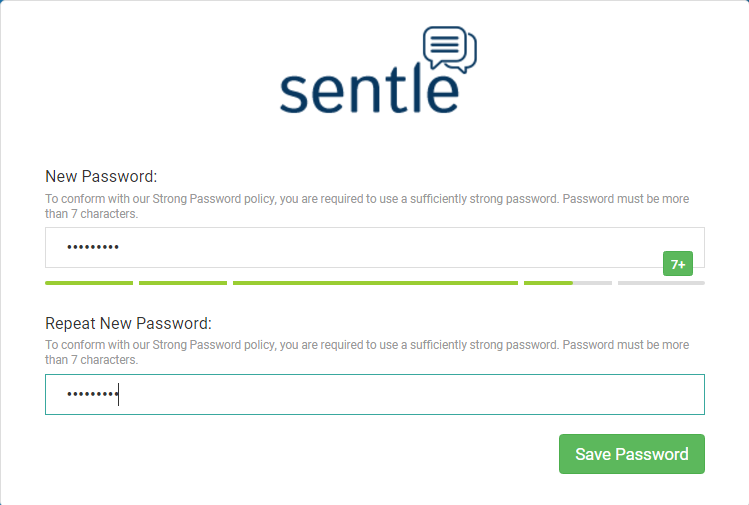 On saving the password they will be taken to the Sentle login page. We recommended this page be bookmarked for future reference before moving on. 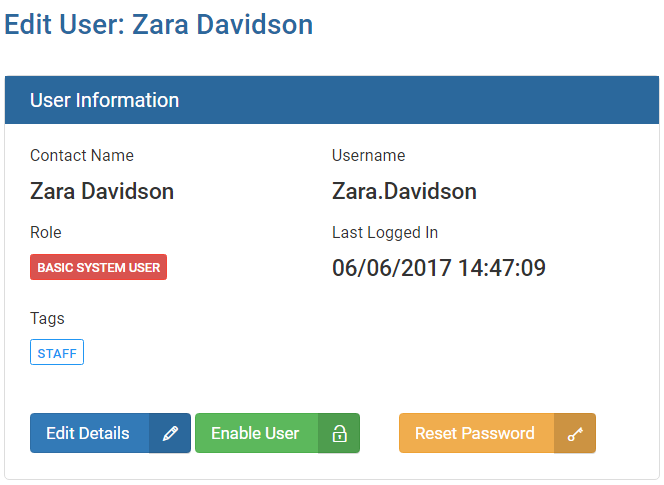 As a Sentle Administrator you are able to edit user details and perform such actions as disabling users and resetting their passwords. Their details are held on a page very much like that of your Sentle contacts with the added functionality as described included. Tags: Tags can be used in the same way as contacts to allow details to show up in searches if required. 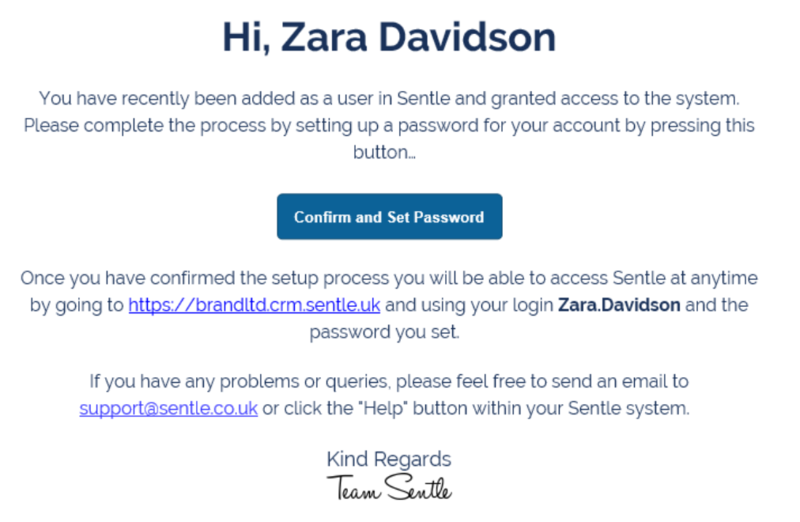 Enable/Disable User: This will determine whether they can access Sentle. Reset Password: Reset the user’s password in the event that they have forgotten/requested it to be changed. Users will be sent an email with the required steps to follow to reset their password. The other details that can be edited on users are the same as those found on contact pages where you are able to add phone numbers, addresses and email addresses. Please note: Adding a new user will create another Sentle subscription (the same as your existing ones) and as such will create an additional charge on your bill. If you disable a user mid month you will still be charged for their subscription until the end of that billing period (month) after which you won't be charged for the user until they are reactivated.